Congratulations, mommy-to-be! Let’s talk about something that will comfort you. Women (especially pregnant women) want to live in leggings. Ask any soon-to-be-mommy, and the answer will definitely be a resounding yes. The second best thing to knowing you have a growing pea in your pod is the freedom to wear comfy clothes all the time. 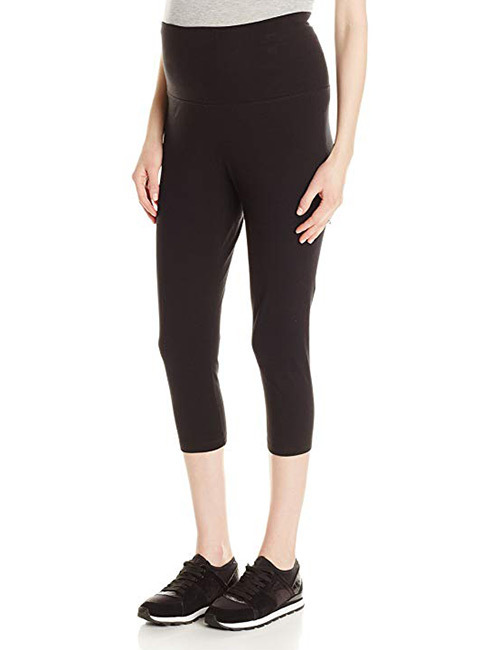 Maternity leggings come in breathable fabrics and cozy fits to cater to all your needs. But you want the best from the lot, don’t you? So, we have compiled a list of the best maternity leggings available on the market right now. Check it out! Ingrid & Isabel leggings top the charts for pregnancy leggings. Their crossover panel stays below the waist when your bump is small and holds it up as it grows bigger. The panel supports your lower back and holds everything in place – so you can wear these leggings while working out too! Their nylon-spandex material is thick, provides good coverage, and is antimicrobial and moisture-wicking. Being tall and pregnant can prove to be difficult when buying maternity leggings. Lucky for us, brands like PattyBoutik specialize in maternity clothing with a full understanding of these nuances. The full-coverage panel of these yoga pants is breathable, weightless, super stretchy, and provides great support to the lower back. You can wear these leggings under dresses and T-shirts. Isabella Oliver Easy Maternity Leggings are made of a super soft premium jersey material that is light on your tummy but still holds everything together. Their band sits comfortably under your belly without pinching your skin. They are perfect for daily wear – be it at work or at home. You can wear these leggings postpartum too, so they are well worth the investment. Everyone swears by the comfort of Motherhood Maternity clothes, and it is a brand that is secretly adored by non-pregnant women too. These ultra-light leggings feature a Secret Fit Belly waistband that you can pull up or fold in under the tummy as you grow. These comfy pair of leggings will accompany you on your 40-week journey and after it too. Looking for something affordable and comfortable that you can practically live your life in? These maternity tights from Fertile Mind check all these boxes. They give you the comfort you need to move around while supporting your growing belly. Their stretchable microfiber material holds onto your belly and retains its shape without getting bunched up. If you swear by capris, continue to wear them when you are pregnant as well. Three Seasons Maternity Capri Leggings feature a light band that sits comfortably over your belly and a breathable fabric that almost feels like you have nothing on your body. After all, with another human growing inside you, your clothes better be as weightless as they can get. Rosie Pope Tummy Control Leggings hug your waist comfortably and give your body the support and definition it needs. These stretch-infused leggings can be used to layer up in winter and with regular tops and dresses in summer. Foucome Under The Belly Maternity Leggings are made from a cotton-spandex-elastane material that gives your body and belly the definition they need without being see-through. The V-cut, low rise waistband tucks snugly under your bump without putting too much pressure on it. Whether it is your pregnancy yoga classes or evening walks, these leggings will be great companions. These maternity leggings from Blanqi offer complete support to your growing belly right from the get-go. Their seamless built-in anchor is made from breathable buttery-soft material that distributes itself evenly over your bump. Their panel is snug and not visible under anything you wear. When it comes to leggings, there is a thin line between stretchable and transparent. Kindred Bravely Maternity Leggings walk that line perfectly – they are stretchy without putting your body on display. They also hit that sweet spot between thick and not bulky, tight but not uncomfortable, stretchy but not thin. When you are pregnant, the last thing you want to do is waste time and money looking for a comfortable pair of leggings. We have compiled some tips and tricks for you to follow to make this task easier. Check them out! Choose elastic bands over drawstrings because they are self-adjusting and do not put too much pressure on your belly. Drawstrings also need to be adjusted constantly. Look for soft-knit cotton/lycra leggings with a little bit of spandex. Figure out what style of leggings are the most comfortable for you – under the belly band, over the top mesh panel, or something that sits just on the belly button. Buy tops or dresses that go well with your leggings. Select brands that can be used throughout your pregnancy (and even after it!). Pregnancy is not an easy journey, but you can feel comfortable by wearing the right kind of maternity clothes. What better way to do it than by investing in a good pair of leggings? Are leggings your go-to piece of clothing too? Let us know by dropping a message in the comments section below.